I used to curse congress for their inability to agree on anything. I am now amazed that they pass even one bill per year and my new found appreciation is due to my family’s complete inability to name an odd puppy that we adopted on a zip line trip in the Red River Gorge. We took my son and a friend zip lining for his birthday. The zip line office is apparently a very popular place for locals to abandon puppies because there is a good chance that some ridiculous tourist will take them home. When we got there to check in there was a large Rubbermaid bin with three puppies (down from the original four). One of the puppies looked exactly like our full-grown dog might have looked as a puppy. Since we adopted our dog when he was a year old we missed out on his puppy-hood and so we did the only sensible thing and adopted this puppy. We named him Zip of course. That should have been that but our daughter wasn’t on the trip and she rejected the name Zip as soon as we got home. For two solid weeks we all proposed names. Eventually we had about 50 names but none that were unanimous and none that stuck. 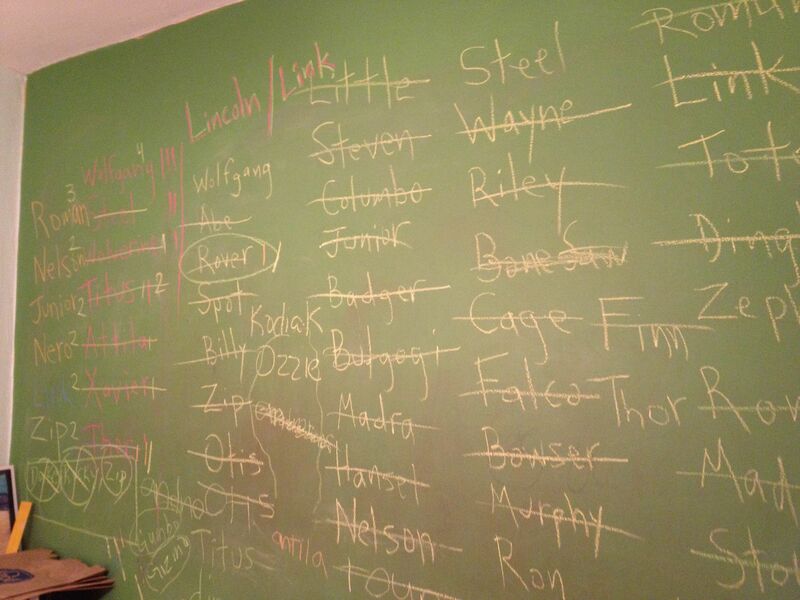 So we called a family meeting and put all of the names up on the chalkboard wall in our breakfast room. We completely filled the wall. Then we took turns vetoing names. We were finally left with five names that no one hated but no one actually liked them either. In desperation we decided to take turns rescuing two names each from the veto list. We voted on those eight and of course none of the names received four votes. A lot of them received three votes but no one was willing to budge. Of course someone had vetoed each of them only minutes before. To make matters worse my daughter seemed to be pressuring one of the other voters (her little brother). We realized that the kids liked the name Link and my wife and I liked the name Lincoln so we decided to compromise and give him two names. Unfortunately everyone continued to call him “tiny” or “little dog” so we went back to proposing new names. We are under pressure from the vet to name the dog and start some serious training since he seems to be mostly Rottweiler and could possibly eat us if we aren’t able to call him by name. I don’t know if democracy can survive in the house much longer. Everyone but me has independently declared a different name for the dog. I am still proposing new names, which isn’t helping matters either.